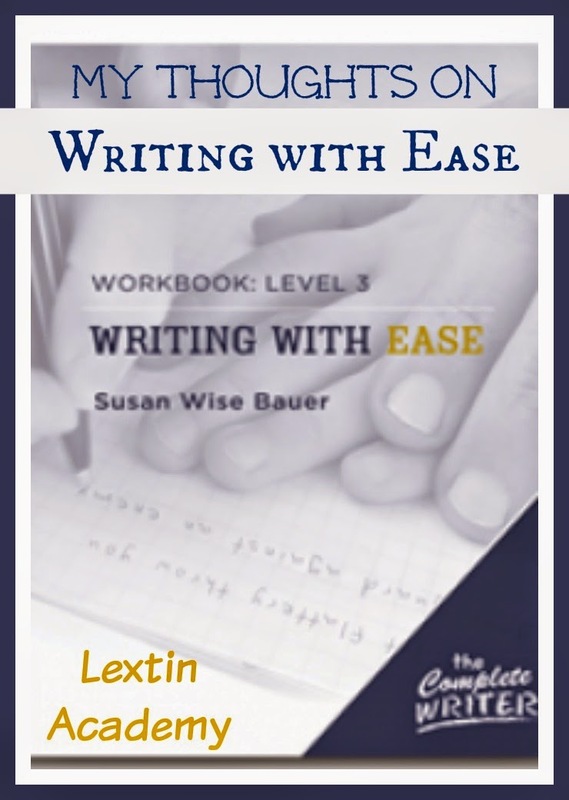 I’m now in my 3rd year of using Writing with Ease from Peace Hill Press. It’s a curriculum that is very easy to implement and it is working well for my kids. Today I’m sharing my thoughts on this program. What levels am I using? First, I only use the workbooks. I don’t own the main text that details how to use the program and gives examples for each of the levels. Can I admit that I haven’t even read that book? I read that the workbooks include reading and copy work passages which meant that I did not need to find my own passages for copy work and dictation. I knew this would save me lots of time. So, I went straight for the workbooks. Day 1 – There are two copy work sentences for practice. You can choose whichever one is the appropriate length for your student or you can have the student copy both. Day 2 – There is a short passage to read and then you ask the child questions about the passage to test their listening and comprehension skills. The then child provides one sentence about what he remembers from the passage. You then write this sentence down on the provided paper. Day 3 – This is another copy work day with two sentences provided. Day 4 – This day has another short passage to read with the child. After you ask the questions about the passage, the child provides another sentence about what he remembers. You write this sentence down and then the child copies this sentence. Curly (3rd grade age 9) is using Writing with Ease Level 3. This level has quite a bit of advanced reading and the dictation passages are sometimes fairly long. In the future, I plan to use other resources for writing in 3rd grade and wait and use this book when my children are in 4th grade. Day 1 – This day has a reading (about a page long) from various sources. Then the child is to summarize the main ideas of this passage. The teacher guide does not have the list of questions to ask the child to help them summarize and recap the reading. There are a couple of guiding questions listed in case the child gives only details without summarizing. Day 2 – There is a dictation passage of about 2-3 sentences for this day. They are fairly challenging with some difficult vocabulary (which also impacts spelling). After the dictation there is direction to mark the sentence for specific parts of speech. Day 3 – This day combines narration and dictation. There is another related passage for the child to read. Then the child should summarize this reading while the teacher writes down the summary. Then, you are directed to dictate the passage so the child writes down his or her own summary. Day 4 – This is another day of dictation with a short passage to be dictated to the child. I will admit that I was nervous about starting Tiger with Level 1. He doesn’t enjoy writing so I was worried it would be too much. However, I’ve found it to be perfect! I can choose which passage he copies for the day and then we discuss the sentence. It is teaching him to use capital letters and ending punctuation and copying the well-written sentences models good sentence structure. He loves days 2 and 4. He greatly enjoys listening to me read the few paragraphs from a story out loud to him. I’ve seen how well he retains the information that he hears and it gives me confidence that he comprehends everything I read to him. He is also able to give me very detailed information when he tells me 1 thing he remembers from the passage. With Curly working through level 3 I have seen her rise to the challenge of reading the difficult passages. We’ve had good discussions about the topics and vocabulary as we work to understand the most important points in each story. The readings are at a high level for a typical 3rd grade reader so if Curly was not such a strong reader, I would need to read the passage to her. This is why I plan to wait on this level until Tiger is in 4th grade. However, Curly is a very strong reader so she has been able to tackle the readings with a little help from me. This has been great read aloud practice for her. Curly enjoys the readings and is able to remember most of the answers to the questions asked in the text. This level contains more questions after the reading and some of these questions are more detailed-oriented. Sometimes Curly has a difficult time remembering certain aspects of the story so she has to go back and re-read. Now that Curly has to both read the story and comprehend the story as she is reading it aloud, I’ve noticed that it is more difficult for her to focus on comprehension. I can’t say that Curly enjoys the dictation passages in the program. Some of these passages are extremely long and contain words that are challenging to spell for a 3rd grader. For these words, I write them on a whiteboard so she can refer to them as she writes her passage. I also repeat the passage more than the recommended 3 times that is stated in the workbook. Overall, I’m really happy with this program. It is building a good foundation for writing skills in my kids. Watch for my next post where I’ll share more about where this program is taking us in terms of skills. Thanks for posting this; it's helpful. I'm trying to make decisions for my daughter's grade 3 next year. Welcome! I'm glad it's helpful. We really enjoy this program and I can see how it's been helpful for my kids.